You will have problems with your sound system from time to time. When you do, Brent Schlosser is the go-to guy to service your sound system. 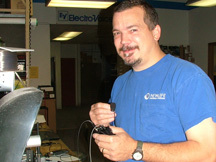 He has successfully worked with many churches to troubleshoot their sound system. Or if your wireless microphone is making annoying crackling sounds you can ship it to Brent's attention. Be sure to include a short note with the item describing the problem you're experiencing - this helps with the troubleshooting process. You can ship your sound system equipment for service to: New Life Communications, Attn: Brent Schlosser, 905 North Hwy 71, Willmar, MN 56201. If you have questions about your sound system you can call Brent toll free at: 800-233-6470.